Angela Cordell Bilger is acting fourth horn for the 2016-17 season, a position she previously held in the 2008-09 season. 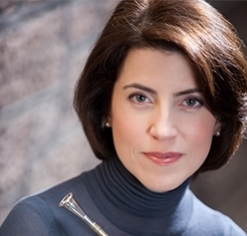 She is second horn of the Opera Philadelphia Orchestra and has performed occasionally with the Pennsylvania Ballet, the Network for New Music, the Chamber Orchestra of Philadelphia, and the Philly Pops. As a freelancer in New York, she performed frequently with the Orpheus Chamber Orchestra and the Orchestra of St. Luke’s, and she also appeared in performances at the Chamber Music Society of Lincoln Center. Ms. Bilger was a participant in the Marlboro Music Festival for several summers and has toured with Musicians from Marlboro. In addition to her orchestral and chamber music work, she has played many shows on Broadway, including Curtains, The Lion King, Oklahoma!, The Producers, Thoroughly Modern Millie, Sweet Charity, Spamalot, Aida, Into the Woods, and La bohème. During the 2001-02 season she lived in Toluca, Mexico, where she was co-principal horn of the Symphony Orchestra of the State of Mexico. A native of Jacksonville, FL, Ms. Bilger began studying piano at the age of six and horn at the age ot 10. She attended Florida State University studying horn with William Capps and Terry Roberts, and the Juilliard School, where she received her master’s degree, studying with Jerome Ashby. Ms. Bilger is currently a member of the adjunct faculties of Drexel University and Temple University.